Welcome to the worlds greatest guide to Women's Leather Wallets. Are you actually looking for Women's Leather Wallets? Well, we hope you are because the reality is that you have found our Women's Leather Wallets page. Apparel Search is a leading guide to fashion, style, clothing, glam and all things relevant to apparel. 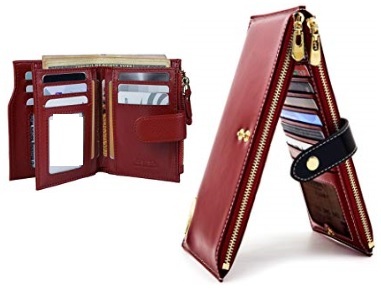 We hope that you find this Women's Leather Wallets page to be helpful. What is a women's wallet? A ladies wallet is a pocket-sized, flat, folding holder for money, credit cards, drivers license, library cards, coupons, receipts, and other items. Essentially, a small bag for holding provisions, especially when traveling outside the home. Leather is a material made from the skin of an animal by tanning or a similar process. Learn about the various types of leather grain that can be used for women's wallets. Leather is a natural durable and flexible material created by tanning animal rawhides and skins. Learn about leather handbags and leather purses. Do you keep your wallet in your pocket or in your pocketbook?